A bowl of soup with someone you love is better than steak with someone you hate. I’ve been crazy busy in the kitchen these days. Trying to get ahead of the appetites in our household is part of what is spurring me on, but the other piece of motivation is my own innate desire to be creative. In truth this desire keeps my heart literally overwhelmed with ideas and opportunities from knitting to embroidery, gardening, storytelling, decorating, journaling, teaching, singing, writing, seeing friends and the list is endless. In recent weeks as I’ve been attempting to gain a little focus with all my ideas, the thought occurred to me that perhaps I could apply my creative desires to a need. And our household is in a season where the need for food is at an all time high. But not just any food mind you – good, wholesome, nourishing food prepared with care and thought, delight and love. Here’s today’s creation, with my adaptations. In a word – satisfying. You might find you need some too. Heat the olive oil in a large, heavy bottomed saucepan over med heat. Add the sausage and cook until golden brown, about 2 minutes per side. Remove the sausages from the pan and set aside. Discard all but 1 generous tablespoon of the fat remaining in the pan. Place the pan back on the heat and add the onions. Stir well and saute’ until translucent, approzimately 5 minutes. Add the garlic and continue to saute for another minute. Add the potatoes stir well and then add the sage and stock. Season with sea salt and pepper to taste, and bring to a boil. Then lower the heat and simmer gently for 10 minutes. 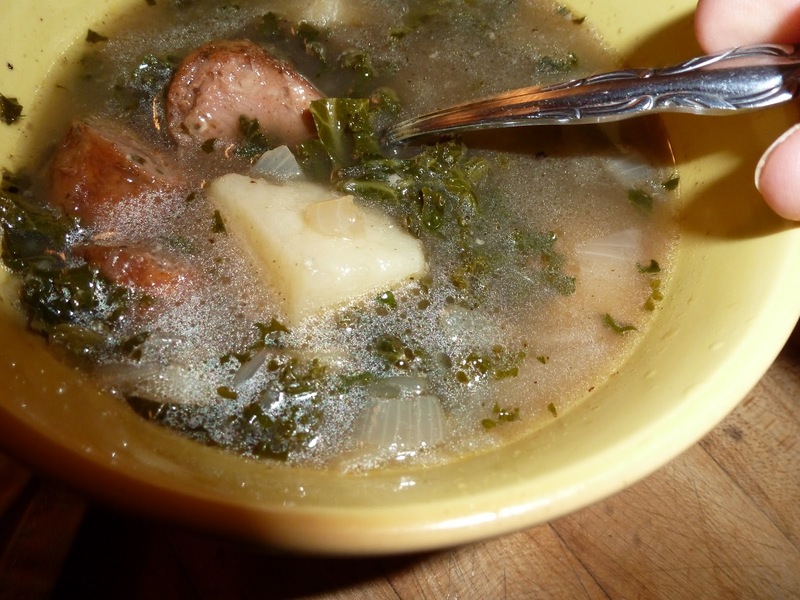 Slice the sausages into bite-size pieces and add them to the soup. Continue to simmer until the potatoes are cooked through and have started to collapse, approximately 10 minutes. Add the kale and simmer for 5 to 8 minutes, until cooked through. Taste the soup and adjust the seasoning if necessary. Serve piping hot and with lots of love.